You are browsing the Blog for vegetable. I had an opportunity to dive into the book, written by by Mark Reinfeld, Bo Rinaldi, and Jennifer Murray, The Complete Idiot’s Guide to Eating Raw. I had not previously read one of these Idiot’s Guides but I found that they use uncomplicated first person language that feels quite direct and the layout is actually a great one because there are useful summaries as you move through the content which leads to great knowledge pick-up and retention. There are little call out boxes with nice tips relevant to the recipe or topic on that page. There is a VERY useful chart showing you times and temperatures for dehydrating a range of foods. As recommended by many raw food chefs, this book suggests starting the dehydrating run at 145 F and then turning it down to 105 F some 2 hours later. This might seem contrary to what you have heard, which is likely that you should NEVER raise the temperature on living foods above 115 F. What is happening in those first 2 hours at 145 F is that the rate of evaporation is higher because there is the most water at the beginning of the cycle. This evaporation COOLS the food so the food is not actually at 145 F, just the air blowing over it. This 2 step process is recommended to ensure that the food you have put so much work into does not begin to mold before it dries sufficiently. There is so much fundamentally useful information in the first several parts that its hard to cover. I think there really is very little if anything they have failed to cover for the beginner and the experienced. As usual in these reviews, I choose a recipe and test it as well as photograph it. I chose the following mushroom recipe and I can tell you, I was quite happy I did. This is an explosively flavorful dish with a lovely contrast between the intense meaty mushroom and the fresh tartly marinated asparagus. It was a huge thumbs up from everyone in my family from the 2.5 yo to the old adults. I also found the marinade so beguiling that I used it on other vegetables, loved it all. undisclosed amount of maple syrup (try 1/4 cup) – book left this out of the ingredients! 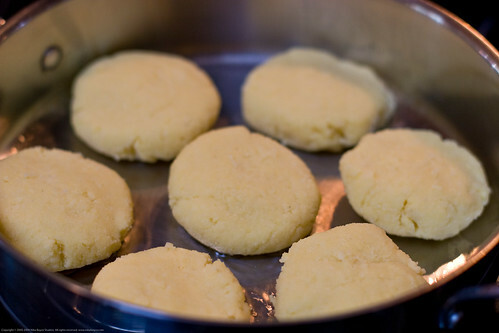 Must caps in quarters and place in a baking pan with gills facing down. Add the water and 1/4 cup nama shoyu and put into 145 F dehydrator for 30 minutes. 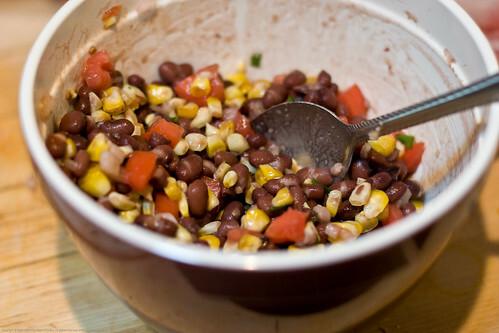 Remove from dehydrator and pour off the marinade (save 1/2 cup). In a separate bowl mix basil, garlic, 1/4 cup olive oil, 2 teaspoons nama shoyu, salt, black pepper. Push mushrooms into this marinade, coat evenly. 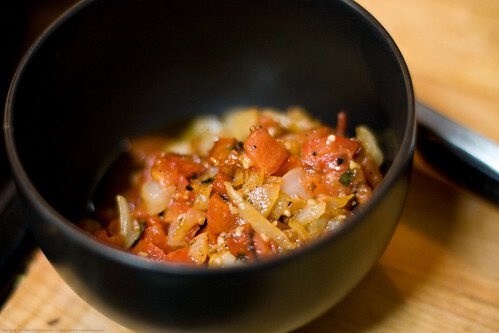 In a bowl, mix 2 tablespoons olive oil, balsamic vinegar, stone ground mustard, maple syrup, 1 teaspoon nama shoyu. 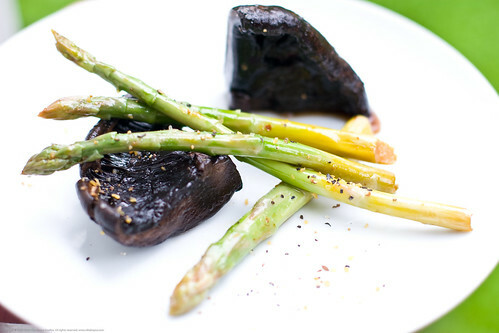 Clean and trim asparagus, put into pan, add this balsamic marinade. Put asparagus in pan into 145 F dehydrator for 1 hour, stir every 15 minutes. After this hour, add remaining 1/2 cup balsamic marinade to bottom of mushroom pan and put it into the 145 F dehydrator with the asparagus for 45 to 60 minutes. Remove from dehydrator and serve warm, if desired (its not bad at all cool). Recipe suggests sprinkling with the bell peppers but I didn’t for my photos. 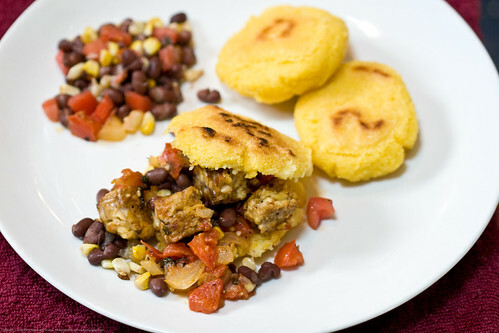 Again, this recipe was amazing and I would recommend it completely, lots of amazing flavor. Some time ago I reviewed a cookbook called “Tassajara Cookbook: Lunches, Picnics, and Appetizers” by Karla Oliveira where I covered Tassajara, a magical mountain retreat for the San Francisco Zen Center. Today’s review covers the related book Tassajara Dinners & Desserts by Dale and Melissa Kent, a beautiful and delicious cookbook that shares simple go-to vegetarian meals used at the Tassajara Zen Mountain Retreat to nourish the monks, trainees and students who live in this amazing place. The photography is just fantastic, inviting you to dive into this book to learn how to make these tasty dinners. The front cover holds nothing back, just take a look at it! 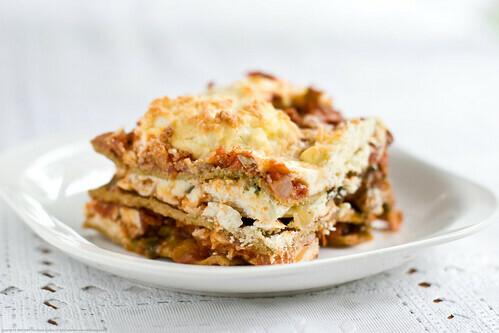 For this review I chose to make the a vegetarian lasagna with a change to the book’s recipe. Instead of just using a store bought past (fresh or dried) I used some homemade lasagna I made from organic sprouted whole wheat I had made (see this post for information on making your own sprouted whole wheat flour “Making Sprouted Whole Wheat Flour” and this post on how to make lasagna pasta out of it “Homemade Sprouted Whole Wheat Pasta“). I also used homemade goat cheese (chevre) from our own goats in our backyard (Making chevre cheese from our home-milked goat milk) and organic chard I grew in our garden and egg from our chickens (Humble Garden). Saute onions, carrots, and celery over medium heat until soft and a bit brown. 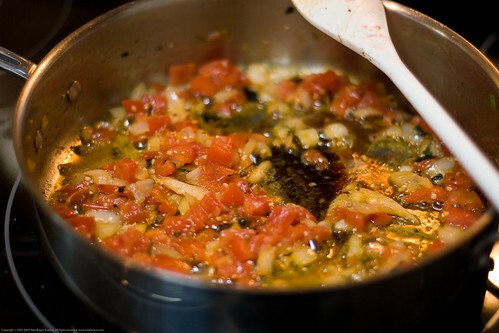 Add garlic and herbs without stirring. Turn up heat to brown and then add wine to deglaze (scrape up fond – stuck bits). Add tofu and cook with much stirring until liquid almost gone. Brown the tofu a bit, coat with all other sauce parts. Add tomatoes and simmer for 30 minutes. Wash greens, remove stems, set the stems aside. Cop stems into tiny bits. Blanch greens and stem bits in boiling water (or steam them) until cooked through. Shock in icy water (this “sets” the chlorophylls so that the chard will be a bright green) and then drain. Chop roughly and then dry completely. Bake the mushrooms in a 425 F oven or sear them on the stovetop. Set aside with the greens. Mix the goat cheese, egg, parmesan cheese and 1/2 teaspoon salt. Prepare the lasagna pasta as per instructions. Oil a 9 by 13 inch baking dish, ladle some sauce on the bottom, add first layer of pasta. Spread 1/4th of the filling over the pasta and cover with some sauce. 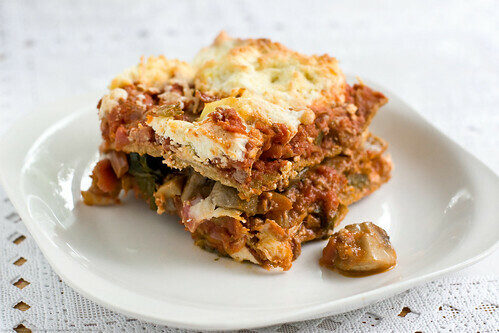 Layer on some tofu, goat cheese, greens, mushrooms as well as mozzarella (if using). Put down the next layer of pasta and repeat as before, 3 more times. The whole thing should end with a layer of pasta at the top and some more sauce. Sprinkle with parmesan and even, possibly bechamel sauce. (I didnt put the bechamel sauce, seemed a bit much to me). 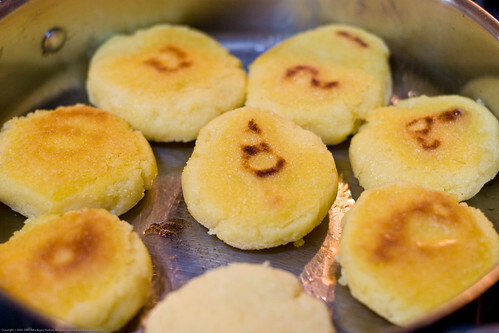 Bake at 350 F for 30 – 40 minutes until the sauce is bubbling and top is toasty brown. Everyone from the toddler on up completely enjoyed this dish. 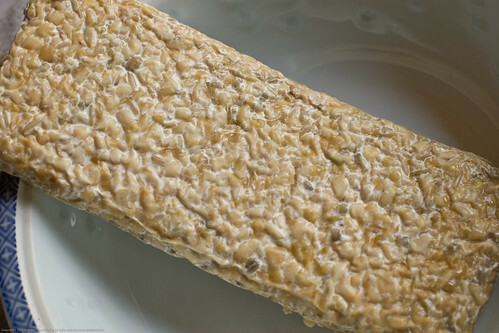 Remember that sprouted wheat yields a bit sweeter product (because the sprouting process started some of the starches on their enzymatic journey) and that any whole wheat pasta product will have a different sort of mouth feel than your usual “white bread” sort of “enriched” pasta product. In this case, the pasta had a lot of presence in this dish, lending an almost “meaty” sort of sensation, which was a plus to those family members who like to have meat at every meal! The book is simply beautiful, the recipes are diverse and quite inspiring for all sorts of eaters: vegetarians to omnivores! I can only say good things about this cookbook, it has been a pleasure to review and oogle over. I suggest giving it a try! Tassajara Zen Mountain Center is the famed mountain retreat of the San Francisco Zen Center. SF Zen center was founded by Shunryu Suzuki Roshi in the 60s. It is a vibrant Zen community (sangha) that has been instrumental in bringing Zen to the West and has served as an important crucible in the inevitable forging process as Eastern and Western thought forms have mixed, melded, and reacted against one another to form a uniquely American form of Zen. You can learn so much by visiting their sites (listed above) and also, if you would like to go deeper, you can listen to teishos on podcast. Teishos are essentially lectures that are interspersed between 30 to 45 minute blocks of silent meditation. The center leader will speak on all manner of things that will help the sangha develop their practice. The more traditional teishos cover koans – extended riddle type narratives that have been used for millennia by the Chinese and Japanese to facilitate the awakening (kensho) of the sangha. Tassajara Zen Mountain Center lies north of San Francisco in the Ventana Wilderness, near the Pacific. I know of it from reading about the SF Zen center, their history (good and bad) and from my life long personal journey in Zen. It is the first zen monastery in the west and is tasked with keeping body and soul together for the many people who dedicate their lives to deepening their zen practice. Part of this has been a delicious tradition of feeding the monks and other visitors delicious vegetarian foods. I have never even really entertained the fantasy of being able to spend time at any of these centers as my life doesn’t afford me such opportunities. Its ok, I, like a huge number of other zen practitioners, practice quietly at home. This doesn’t mean that I don’t think on how splendid it would be to be able to spend time at Tassajara in quiet bliss, practicing and also enjoying the wholesome foods (grown on site and also at Green Gulch Farm). Today I am going to talk about Tassajara Cookbook: Lunched, Picnics, and Appetizers and will cover Tassajara Dinners & Desserts in another post. This book gives you some background on the monastery as well as how lunches have become elevated to these feasts of wholesome and tasty goodness. The recipes in this book open a window onto some of these offerings. The breadth is fantastic and the images are simply beautiful. Whether you are vegetarian or a carnivore, you should be able to appreciate the mouth watering recipes in this cookbook. There are so many delicious possibilities to chose from, it was hard to pick. In the end, I went shopping for ingredients on a very hot day (we were taking a run for 95 F on that day here in MA) so I chose a cold recipe. It is also the recipe featured on the cover of the book. I certainly didn’t do the cover any justice but we were VERY happy with the results. 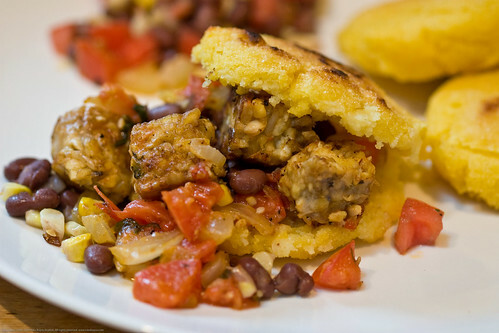 Our taste testing for this recipe came out a resounding YUM. 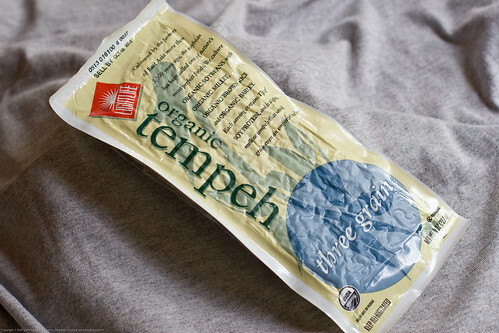 We usually do NOT eat tofu (so many issues with soy products and we are not vegetarian so we don’t use it to replace other protein) but I made an exception for this review. 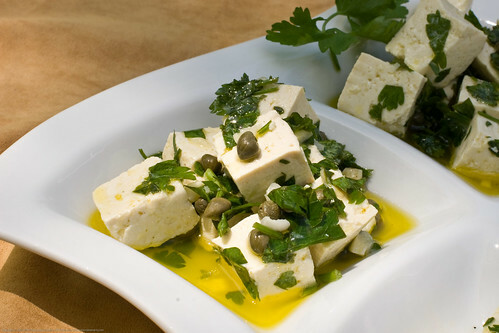 This means that my family (DH, kids – 12 yo, 5 yo, 2.5 yo) are not accustomed to eating tofu. When the DH and 12 yo tried it, they loved it and got many tastes. The 5 yo is in a picky phase so she decided against more. The surprise was the toddler, who called it cheese, he could not get enough! He just loved it. He loves any sort of cheese, especially brie, so I am guessing he just fit this into his cheese universe. I am definitely going to be making more of these recipes. Let me know if you get the book and which ones become your favorite! 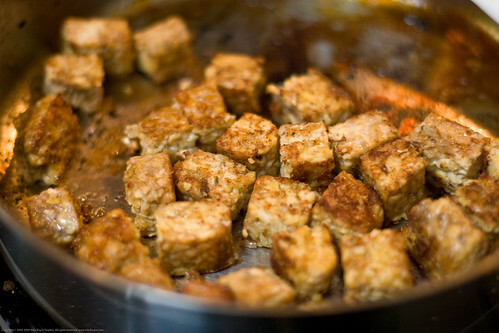 Slice the tofu into cubes. 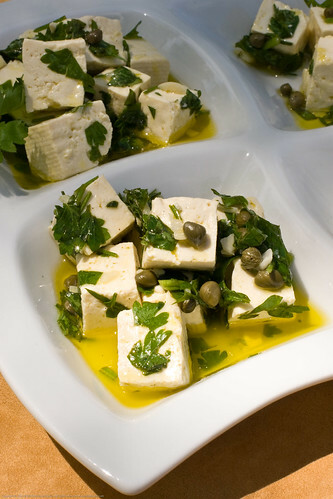 Mix garlic, parsley, salt, pepper, capers, lemon juice, and fresh herbs in a small bowl. 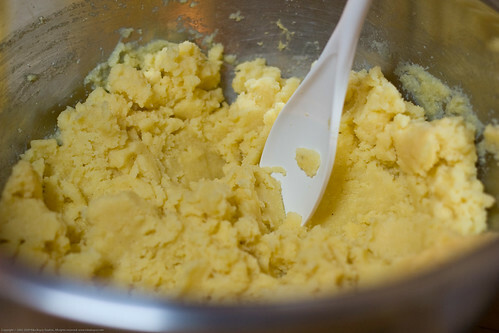 Let this mix sit a few minutes and then add the olive oil, stir. 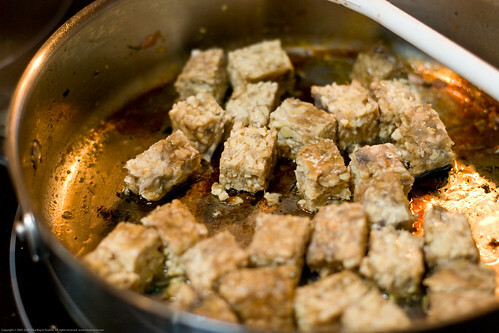 Add the tofu and gently mix to coat all pieces. I added all this to a baggie, purged the excess air and then closed it up. I let this marinate overnight in the refrigerator. Next day, let come to room temperature and serve with a sprinkling of fresh herbs.